After we finished dinner at Crystal Palace, four of our 10-person group left to go back to the hotel. 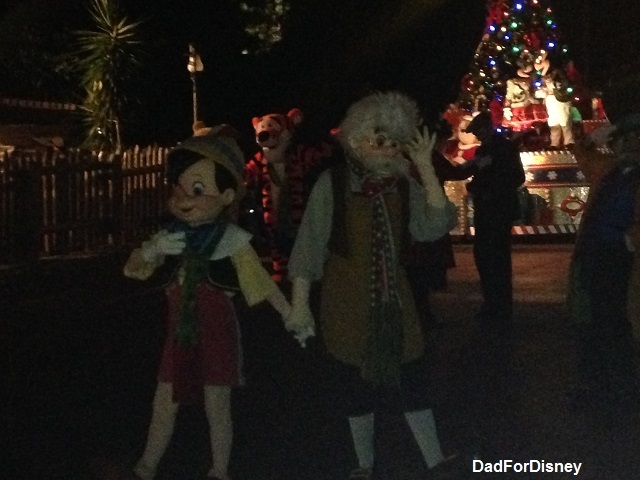 The remaining members stayed for Mickey’s Very Merry Christmas Party. For my family, this would be our second time attending the Christmas Party while, for the others, it would be their first visit. 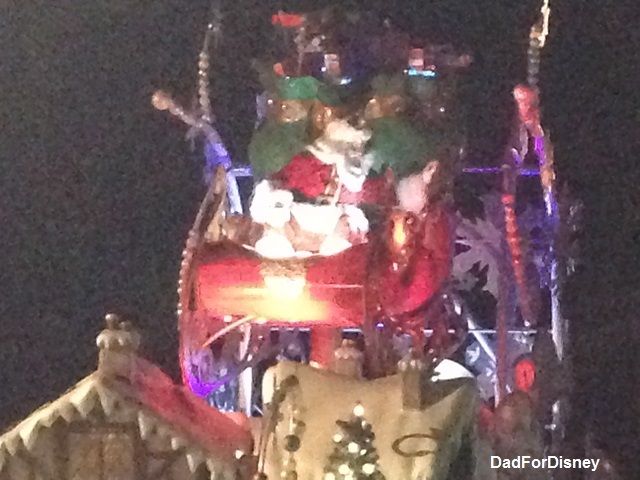 For a good portion of the party, we were able to divide and conquer and everyone was able to go attractions that they wanted to go and see parades and fireworks shows that they wanted to see. The first part of the party was a divide and conquer. My wife and I were second in line to meet Scrooge McDuck. While, my sister-in-law and her husband took the kids to go on some attractions: It’s A Small World and The Mad Tea Party. 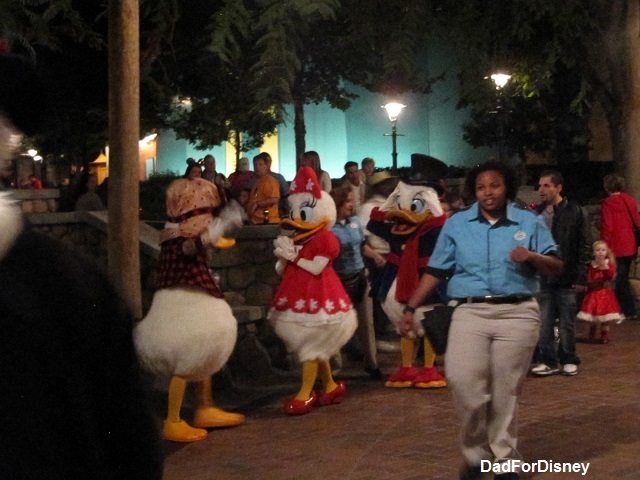 This is one of the few occasions when Scrooge McDuck leaves his vault and comes out to meet guests. We had missed meeting him on our first visit to the party so we wanted to make sure that we met him on this visit. 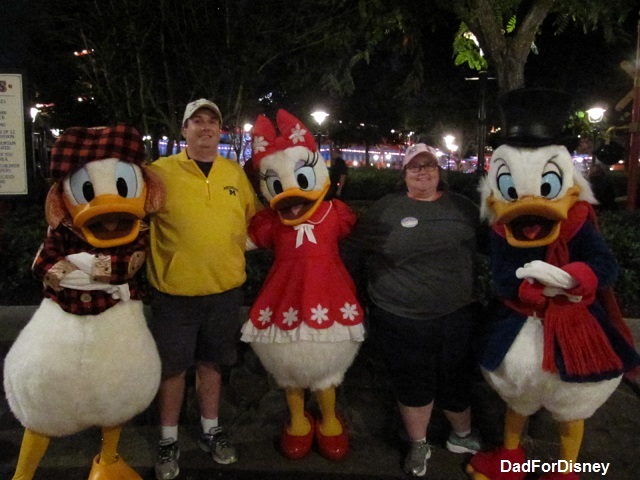 Scrooge started to meet guests at 6 pm and I was in line shortly after 5 pm and my wife joined me around 5:30 pm. 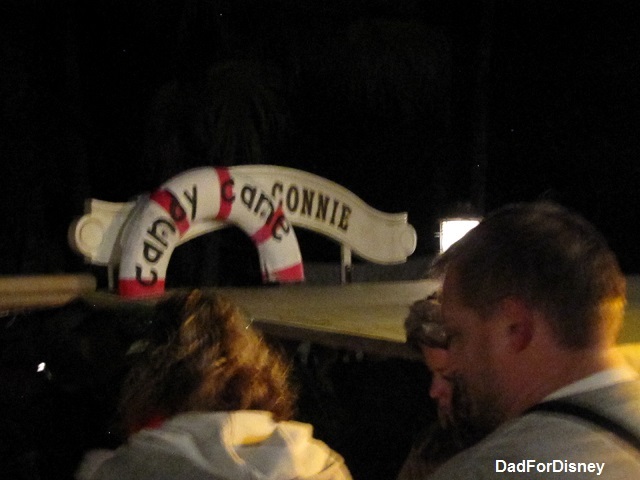 As a result, we were second in line as a lot of guests were in line to meet The Seven Dwarfs or Sandy Claws. Those meet and greets had long lines. 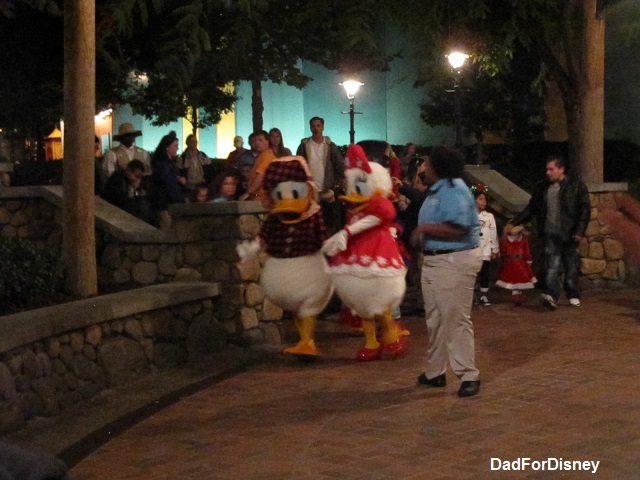 Promptly at 6 pm, Scrooge came out with Donald and Daisy to meet guests. I asked Scrooge for a key to the vault but the penny-pinching duck would not give it to me. I guess that’s how you become the richest duck in Duckburg. After the attraction, we broke apart into smaller groups again. This time, my daughter and I went on more attractions – including my daughter’s first time on Space Mountain (interview with her about her experience coming soon). 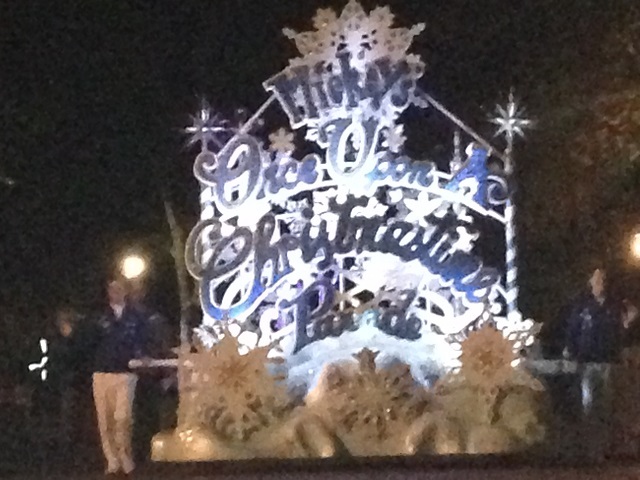 My wife went with the others to join the masses on Main Street to watch the Very Merry Christmas Parade followed by Wishes. 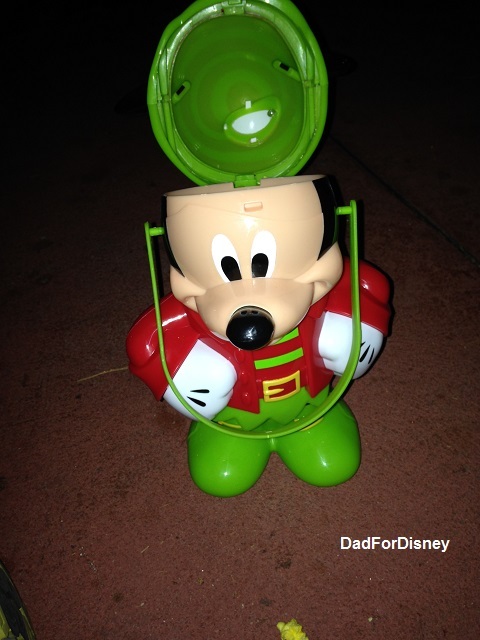 After my daughter and I were done on attractions, most of which had a short wait because of the parade, we made our way to Frontierland to get a good viewing spot for the second Very Merry Christmas Parade and eat some popcorn out of our new popcorn container. After Wishes was over, my wife made her way to Frontierland to join us and we camped out until 10 pm and the second parade started. My wife’s impression was Frontierland is a better place to watch because of the smaller crowds compared to Main Street. You can get a front row spot up until around 9:40 pm. Trying doing that on Main Street. After the parade, it was getting well past 10 pm and we had been going since 3:30 in the morning. We walked our way through Frontierland and Adventureland. Passed up a chance to get either a Citrus Swirl or a Dole Whip. Got into The Emporium gift shop. Purchased a couple of things and headed back to the room for some much-needed sleep. 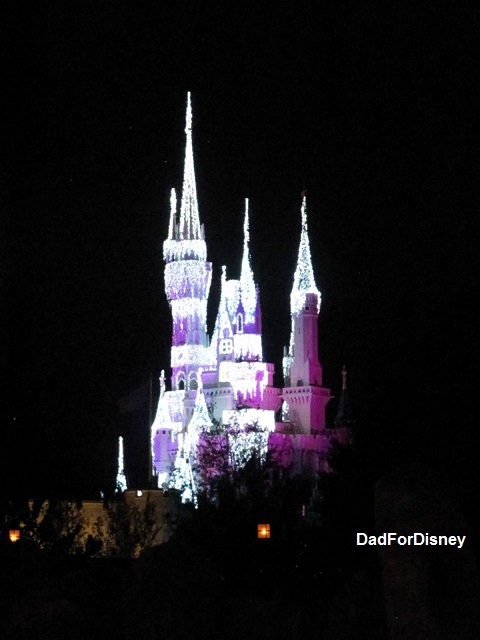 This night was a great example of what smaller groups can do at Walt Disney World compared to a larger group. Staying in a larger group requires consensus for the group to do or watch anything. The larger the group becomes, the harder consensus is to achieve. The small groups allowed everyone to see and do what they wanted to see and do. Time wasn’t wasted with discussions about what to do. We formed small groups. Those groups came up with their plans and we attacked the park. I can say, based on my wife’s reports, that the areas behind Cinderella’s castle were much less crowded than the areas in front of the castle. Everyone wants to watch the parade on Main Street. 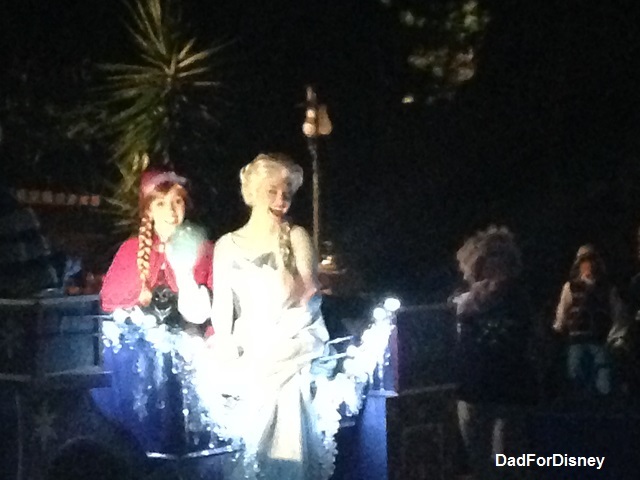 It’s still the same parade on Frontierland as it is on Main Street. You’ll face a smaller crowds and have a better chance of a good viewing spot.